Walter’s has been around Portland for a while. It’s had different owners and different locations, but regardless of where it’s been or who’s been running it, the one thing that keeps me going back is that it’s always really damn good. Currently located at Two Portland Square, the beautiful restaurant contains a reasonably-sized dining area to the right of the entrance and a bar/lounge area to the left. The bar is particularly well stocked and has a great variety of all the libations you could want. We had reservations and arrived a little early. There appeared to be available seating at the bar and we figured we’d order a drink while we waited. We sat at the bar and were promptly handed a drink menu. In my opinion, Walter’s has some of the best drinks in Portland. It seems that every time I try a new one, I’m just blown away by how good it is. I browsed the menu seeing both old favorites and ones I haven’t had the opportunity to try yet. Once again, I was shocked at how many drinks looked like sure winners to me. After some thought, I went with one of my faves – the Kentucky Creekside with Knob Creek, Cointreau, Lemon Juice, Lime Juice, and Syrup. My wife ordered white wine, of course. After a few moments, the drinks arrived in front of us. My Kentucky Creekside showed up in all it’s glory with slices of both lemon and lime on the glass. I let it marinade for a minute and took a sip. The citrus added just the right amount of acidic flavor to the whiskey concoction and the syrup gave it a perfect understated sweetness. It was so good it would make your mama cry like when she found out you got your first piercing. More restaurants need to get in on the whiskey/fruit combination. Walter’s has it down to a science and with the exception of one other place I went to recently, I can’t think of any other joint that has a solid drink of that nature. If you have a restaurant that has one, shoot me a message and I’ll consider going there to try it. With about a quarter of my drink finished, we were informed that a dining room table was a few minutes from being ready, but that a lounge table was immediately available. We moved about eight feet to the lounge table. Once we got there, menus and water were promptly delivered. Bread and olive oil followed shortly thereafter. We gazed at the menu for a little while. I wanted to try at least one new item. While I considered the crab cakes and calamari appetizers, I had eaten those on previous visits. 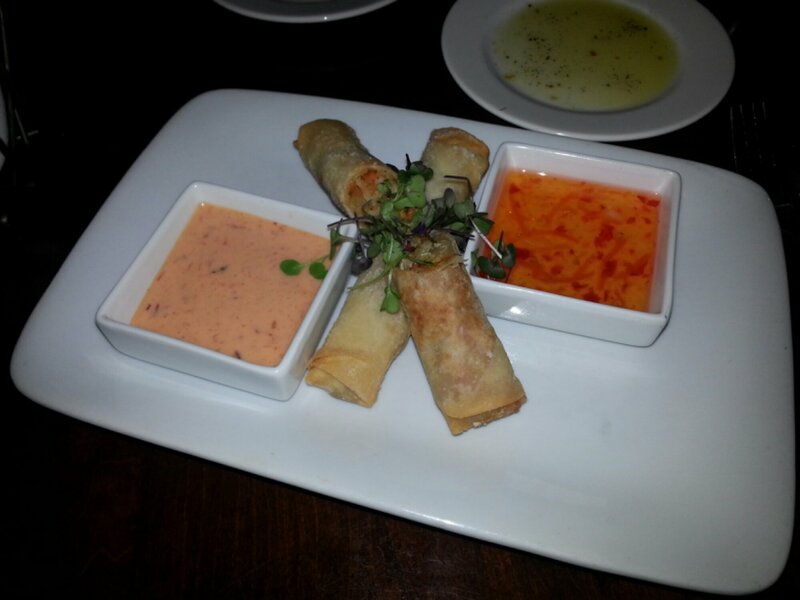 Instead I settled on the Spring Rolls – Chicken Confit, Coconut Chili Carrot Sauce, and Harissa Honey Crema. For my entree, I considered both seafood and landfood options, but after carefully weighing the haddock and scallops possibilities, I settled on the Bistro Burger with Wagu Beef, Lobster, Basil Pesto, Shallot Chevre, Sesame Roll, and Truffled Parmesean Fries. My wife selected the haddock. Between bouts of arguing with my wife over the best planet in the solar system and creating a mental list of the difference between foot fetishists and Sneaker Pimps, I dreamt of spring rolls appearing in front of me. It turns out they showed up just as I was extolling the virtues of Neptune and it’s occasional, but somewhat pretentious, title of furthest planet from the sun. I had hoped that spring rolls would bring forth the season I had been so missing but they didn’t. However, while the spring rolls failed to bring warmth, sunshine, and bluebirds to my table, they did look pretty damn good. My wife watched from the other end of the table as I first inspected, and then said to the first spring roll, “You know who I am. Say my name!” Without giving the spring roll any time to respond, I bit into it with the fury of a man possessed by demons. The chicken was plentiful and the veggies in it were crunchy, but as with most spring rolls, it needed to be sauced. I tried the chili sauce and then the creme sauce. Excellent! The chili sauce was the typical but delicious sweet and spicy combo while the harissa cream sauce actually had a similar flavor composition but with a creamy base. I swept my rolls through one sauce before each bite, alternating sauces each time until there were no spring rolls in sight. Next up for us was the main course. Without delay, the empty spring roll plate was taken and only a short time later, the burger and haddock were delivered. The haddock was served on top of lobster mash and spinach. My burger had plenty of lobster on top and came with quite a pile of fries. I first tried the fries. They were great – so crispy, so fresh-y, and so truffle-y. They were good with and without ketchup. I decided it was time to try the burger. It was perfectly well done as requested. While this might not seem like a big deal, I must say that it is pretty common that burgers aren’t cooked as they are ordered. The lobster was super and took the burger to another level by adding a bit of surf to my turf. I’m not a big fan of pesto, but the pesto was good enough that it didn’t affect the burger for me one way or another. The cheese and bun complimented the rest of the ingredients quite well. We chowed down until we began to nibble on our plates and the fat lady sang. I was pretty certain we wouldn’t eat dessert, but we did take look at the menu. When I saw the Warm Banana Bread Pudding and selection of cognac, I began an internal struggle to determine the appropriate course of action. In the end, I decided to pass on the pudding and drinks rather than pass out from a food overdose. It was a difficult choice, but it was the right thing to do that night. The angel on my left shoulder said so. Like flashing a gang sign on opposing turf, we gave the signal that we were dessert deniers and received the final tab. The total for two drinks, an app, two entrees, tax, tip, and some good company? About $100. Was it worth it? Absolutely. Walter’s continues to impress me every time I go. They’ve been rock solid over the long haul and that consistency keeps bringing me back. Don’t hesitate to go there and sit at the bar either. If you’re looking for a night out with some awesome cocktails, you can’t go wrong with their drinks. They are delicious and pack both flavor and a potent punch inside your glass. Regardless of why your going though, Walter’s is sure to please even the most discerning foodie’s pallet. Want to be notified whenever Peterpeterportlandeater releases a new blog entry? Subscribe to my blog by clicking the “Follow” button on the right side of this page. This entry was posted in Portland, ME food on March 27, 2014 by peterpeterportlandeater. When I was last at Petite Jacqueline, there was no snow on the ground and the temperature was in the 70’s. If I remember correctly, that was before I had a driver’s license or facial hair. The James Beard nominated restaurant has long been a popular place in Portland with it’s French cuisine and relaxed atmosphere. We had reservations for four as friends were visiting and liked the look of the menu. Based on a very good meal last time I was there, I was excited to return and hoped to get an encore of their prior performance. Because it was restaurant week, there was a prix fixe menu on the table along with a bunch of other menus including the one with standard fare, a cocktail and beer menu, a wine menu, and a charcuterie and fromage menu. When the waitress visited our table to ask if we wanted bottled or tap water, I suspected she might help us sort it all out, but she mostly just indicated that the prix fixe menu was an option if we were interested. After quickly looking at that, we decided to order à la carte. Drink menus were passed around so we could search for the happy juice that would give us the joie de vivre. With some careful thought we decided on a selection of beer, wine, and cocktails. I chose the Ginger Pear Marguarita – an obvious choice at a French restaurant – after being warned that the first drink I chose came warm. The warning came more as a foreign language refresher as the French word for “hot” – chaud – was in the name of the drink. As the waitress left après order, we went on the hunt for our perfect food selections. Petite Jacqueline’s menu was rife with appetizing options. By the time the waitress returned with drinks and a baguette, we had selected our food for the evening. 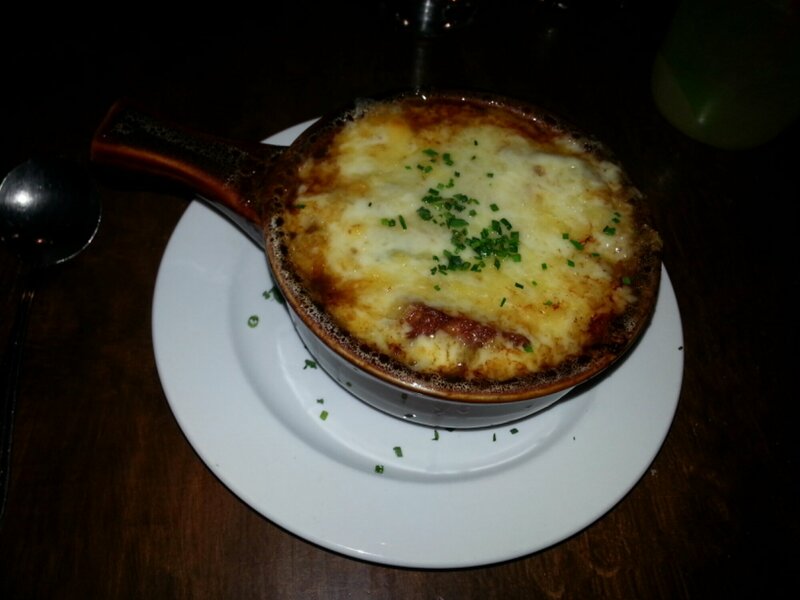 I focused my beady, little eyes upon the Soupe A L’Oignon – onion soup with gruyere cheese. I suspected some beef would be a good compliment to the soup and ordered the “French Attitude” Burger with gruyere, caramelized onions, house aioli, and fries. Selections of Roasted Cauliflower Soup, Poisson Meuniere, and Gnocchi Parisienne rounded out the orders at the table. We also ordered a last-second Frites to share. Drinks seemed to go down smoothly for everyone. I tried my margarita which was served in a Mason jar. The pear in the drink tasted fresh and was pronounced. The ginger was the same, but for my tastes a bit too strong. This was just a personal preference as I think most would have found it fine. Nonetheless, I was pleased with the concoction on the whole. Thinking the baguette would be a good addition to my marg, I took it out of it’s serving bag and placed it on the table to cut. My wife quickly reminded me of my faux pas, suggesting that it should be left in the bag and simply pulled apart as required. It was a good reminder and I quickly pulled off a piece that was much larger than my share. I sucked it down with some butter and before long, all the soups and fries came out. The onion soup came in a crock with a layer of cheese on top. Before trying that, I procured a few fries. They were served with both ketchup and aioli. They were pretty good, but I couldn’t stop eyeing the soup. I dug in by plowing through the cheese in order to taste only the broth. That was the official method of judging the soup. Cheese will make anything great, but how was it without the cheese? I sipped the broth from my spoon. It was outstanding! The next bite included some onions. Outstanding! Then I spooned a piece of crouton, which still had plenty of crunch. Outstanding! Finally, I gathered some cheese. There was a virtual wall of the crusty, baked goodness covering the crock. I took a piece with some broth and put it between my lips. Out. Standing. Absolutely the best onion soup I ever had. It was salty with plenty of onion sweetness and the cheese was spectacularly baked and browned. The soups seemed to go over well with the entire table. It was a great start. Entrees were next. Our main courses came shortly after we took our last slurp of soup. My burger looked a little small, but it was thick. Cheese was oozing off of it as were onions and aioli. I had fries from my plate first. Like the fries we shared, they were crispy and fresh. The aioli took them to another level. Then I opened wide for the beautiful burger. I shoved it into my mouth and bit down just hard enough to get my teeth through it without causing a dental emergency. For some reason, the majority of the toppings escaped the first bite so I hurried to take another. Whamo! The flavor of the burger was so delicious that it created a level 5 shield of protection from mind-eating zombies around me. It pretty much felt like I was eating another order of onion soup, but this time on a burger. That definitely wasn’t a bad thing. I chomped the pickle on my plate. That was hella good too. This entry was posted in Portland, ME food on March 12, 2014 by peterpeterportlandeater.